*This review is based on advanced reading ecopy. There might be some changes with the finished copy. What if you look through the looking-glass and see a different version of you? A version of you who changes the way you are? What if that version of you--that is not really you--wants to trade places "for the better"? 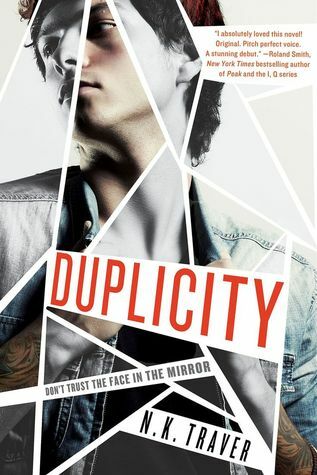 In N.K Traver's contemporary sci-fi debut novel, Duplicity, Brandon, a computer-hacking teen meets someone like himself who isn't him in front of a mirror who wants to change his life. But could this be for the better or for the worst? The first thing I--anyone would--noticed with Duplicity was the uniqueness of the story/concept. Although the 'bad guy punished by a witch/fairy godmother/someone with powers to become better' was familiar because a local children's fantasy show here in the Philippines called Wansapanataym (Once Upon A Time) caters the same theme, Duplicity has something that stood out, angst, and all the techie nerdy thing. I also like the idea of it and the twists this book had in a nerdy way. Readers would ponder who really the bad guy is and what Brandon really is. Is he the bad guy or the next hero? The book started like it was already in a middle of a story with some untold background stories, and I've been like left in a middle of an unknown city for a while, but as the pages go by, the characters and their story were introduced one by one flawlessly without having a boring length of paragraphs with explanations of like this and like that. Of course except with the techie details. I'm not techie so I might have read the about it but if you'd ask me now, I have already forgotten what it said. The bad thing was on my side, don't worry. Uniqueness was Duplicity's strongest attribute. Enjoy a past-paced cyberthriller with twists you wouldn't see coming. I really liked Duplicity--it's fun and refreshing and has a main character you'd be pinning for. Definitely a new trend in YA world you must look for! *Thank you so much St. Martin's Press/Thomas Dunne Books for the review ecopy in exchange of an honest review!